Inuktun Sighting #157: Portable and Powerful Operations with Remotely Operated Inspection Robotic Solutions — Inuktun Services Ltd.
Hey, have you heard? As part of the recent acquisition of Inuktun by Eddyfi Technologies, the Inuktun InCommand Robotics’ team (based in Texas) has moved to Eddyfi Technologies’ office located in Deer Park. Swing by to see them in their new location and learn about our off-the-shelf rental solutions while you’re at it! 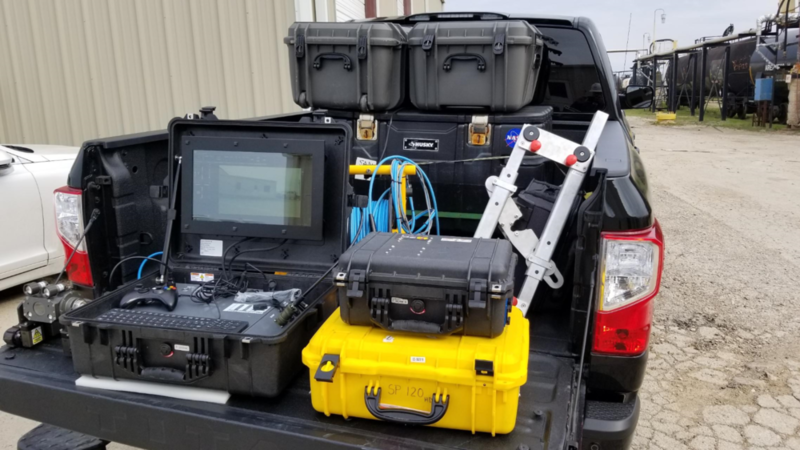 This week’s #InuktunInTheWild sighting comes from the Texas team who took the photo below demonstrating the true one-man portability of our IM3™ (Multi-Mission Modular) technology. You’ve got places to go and people (or pipelines, pressure vessels, railcars…) to see. One of the great benefits of our mobile robotic crawler and camera systems is their shared components. Less is more when it equates to less to haul between job sites. Our ICON™ Portable Controller (IPC) operates both the STIK™, Spectrum Tank Inspection Kit, and the MaggHD™ pictured here – saving inspectors time and money! Inuktun’s STIK™ revolutionized tank inspection with its release in April 2018. The solution for reducing the costs and risks associated with confined space entry, the STIK™ is a turnkey remote visual inspection (RVI) system for integrity assessment of tanks, pressure vessels, tank cars, and more. See it in action here. Inuktun’s MaggHD™ miniature magnetic crawler is an OnSite Standard Product readily available for rent or purchase. It is the popular industry choice for remote visual inspection of steel structures like wind turbines, storage tanks, ship hulls, offshore oil platforms – in air or underwater, even in the splash zone! Watch it performing an internal and external wind turbine inspection here. The true modularity of our IM3™ technology delivers significant time savings and cost efficiencies. Contact the team to discuss your specific RVI and NDT requirements for robotic solution now – we’ll wait for your #InuktunInTheWild submission to follow!